You’d be forgiven for thinking that the Bar Harbor Grand Hotel dates back 150 years. 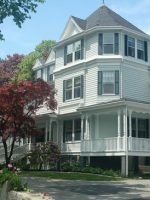 Modeled after a Victorian grand hotel that used to be the place to summer in Bar Harbor, it exudes old-school elegance in its design and dÃƒ©cor. 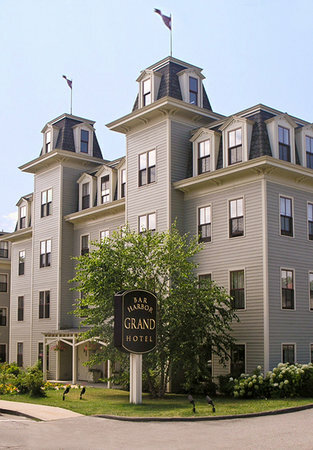 However, the Bar Harbor Grand isn’t one of the oldest hotels in town, but one of the newest, built in just 2003. 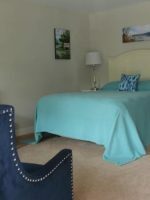 In a short-time, it has also become one of the most popular places to stay in town, as much for its dÃƒ©cor and service as for its enviable location on a hill just above Bar Harbor’s town green, close by to all of the town’s restaurants, and a short drive from Acadia National Park. The hotel is modeled after the Rodick House, a behemoth of 400 rooms built in 1866 that was once the largest hotel in Maine and played host to Rockefellers, Carnegies, and Vanderbilts in the early days of the Gilded age before they began building their own “summer cottages” (mansions) on Acadia’s rocky shores. At a more modest 70 rooms, it’s not quite the size of its predecessor, but the Bar Harbor Grand Hotel still retains enough character to evoke that era. It’s also not quite a luxury resort, but a very comfortable hotel, with spacious rooms far above average in size (and a few that are downright enormous), a large breakfast buffet, and outdoor pool and hot tub. The Bar Harbor Grand Hotel is a Witham Family Hotel. A full 64 out of the 70 guestrooms in the hotel are Deluxe Rooms; 39 have two queen beds, and 25 have one king bed. The rooms are very spacious, each with a sofa and ample room for a rollaway bed for a fifth person. Rooms are decorated in a grand style with rich gold and burgundy accents, and modern fixtures with a nod to the Victorian age (four-poster beds, heavy curtains, table lamps with curved shades). Beds are supremely comfortable with Englander pillow-top mattresses, and the air-conditioning is surprisingly quiet and unobtrusive. All rooms include a refrigerator, flat-screen TV with complimentary HBO and DVD player, coffee maker and free Wi-Fi. The hotel also has four, Two-Bedroom Suites with three queen beds each, which can accommodate up to six people. For true luxury, the hotel offers two more Family Rooms that are each easily the size of two hotel guestrooms put together. They each feature two queen beds, as well as a queen-sized sofa bed, perfect for large families of up to six people wanting to share a single room. All of these rooms are decorated similarly to the deluxe rooms, and share the same amenities: refrigerator, flat-screen TV with complimentary HBO and DVD player, coffee maker and free Wi-Fi. Rollaway beds and Pack N' Plays are available for free upon request. Grand Hotel was indeed Grand! questions, beneficial. Love how this hotel must be old, but the original charm and style has been maintained. We loved the windows on the 4 th floor where we were. The room was so clean and decorated beautifully. 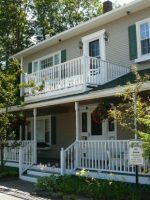 Nice and quiet here and location within walking distance of restaurants. A good value as well. 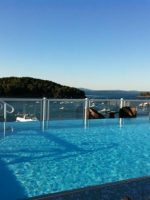 The Bar Harbor Grand Hotel has a 25-by-40-foot pool in the back that is heated to 82 degrees, as well as a Jacuzzi hot tub heated to 102 degrees. The hotel offers a library of G- and PG-rated DVD's for rent for $1 a piece. A gift shop on the premises sells kids' books, stuffed animals and blueberry soda. The hotel also offers packages that include a cruise with Acadia Nature Cruises, a tour of Acadia National Park, and/or a sail aboard the windjammer sailboat Margaret Todd. The hotel's location in downtown Bar Harbor makes it easy to venture out to boat cruises, comedy shows, shopping, and restaurants. A stay at the Bar Harbor Grand Hotel includes a complimentary breakfast buffet that overflows with cereal, muffins, hard-boiled eggs, waffles, French toast and other breakfast options to fill your stomach before a big day out on the trails. 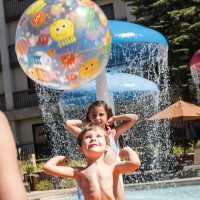 While the hotel doesn't have its own restaurant, it is a short walk to literally dozens of family-friendly restaurant options, including seafood, Italian, burgers and pub fare. A small fitness room is located in the basement with a treadmill, exercise bike and free weights. A coin-operated washer and dryer are also located in the basement near the fitness room. The hotel carries a list of experienced babysitters available upon request. The Bar Harbor Grand Hotel is open between early April and early November every year, though it does the bulk of its business during the high season from late June to late August. Rates drop dramatically in the shoulder season of May and September, but then again, so do temperatures, so bring a heavy jacket. While Bar Harbor is full of the energy of tourists and kids during the summer, many visitors think Acadia National Park really comes into its own in September, when the roads are less crowded and the foliage has begun to light up the trees. Bar Harbor is a five-hour drive from Boston and about 10 hours from New York. Alternatively, visitors can take a flight to Portland International Jetport and rent a car (the trip is about three hours) or fly into Bangor International Airport and rent a car or take a shuttle to Bar Harbor, which takes about 1.5 hours and runs five times daily. Surprisingly, a car is not necessary to enjoy Bar Harbor or Acadia National Park; the free Island Explorer shuttle makes trips between downtown and all of the hotels, as well as making several routes through Acadia National Park and the rest of Mount Desert Island. Those taking their own cars will need to get a weeklong pass for the national park at the visitors' center, available for the bargain price of $20 per vehicle. It's worth getting a babysitter for the night to catch dinner at the Bar Harbor Inn, a luxurious hotel with a romantic view of Frenchman Bay and a menu of decadent classics like lobster sherry pie and filet mignon with wine sauce. 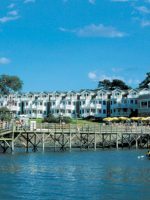 As a fellow member of Witham Family Hotels, the Bar Harbor Grand Hotel offers several packages that include discounted dinners at the Inn.